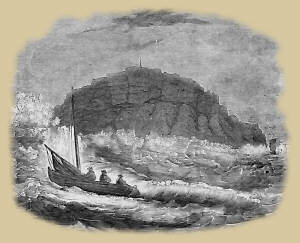 Concluding the presentation of items from the "Cumberland Pacquet" newspaper, illustrating the effects of the tempestuous weather on communities and shipping in Cumbria, at the beginning of 1796. Most items are quoted verbatim, with spelling unmodernised [editorial comments bold, in square brackets]; the illustrations do not relate to the 1796 events or to the local area. CP 9 Feb 1796: As an encitement to others, who have the ability to perform similar acts of benevolence, we take the liberty of saying that Lord MUNCASTER has been extremely bountiful to the inhabitants of Ravenglass, (who suffered so much by the storm) in giving peats, coals, mutton, soup, bread, ale, and money.- Mr IRTON, coming accidentally to that place, on the Monday after the hurricane, and seeing the devastation made by it, and the distresses of the poor, left five guineas with Mr Bragg[? ], surgeon, to be distributed according to their necessities. No person living, in this place, remembers such a long continuance of westerly winds as has recently been experienced. Such have prevailed, with scarcely any variation, for almost four months. 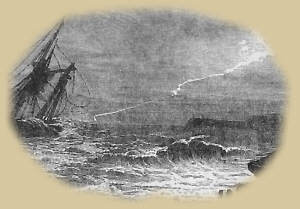 A change, such as it is hoped will prove in some degree effectual, took place on Saturday; a few vessels sailed on that day, and thirty-four got out on Sunday. CP 16 Feb 1796: The damage done to the Hotel at Skinburness, by the late flood, is not so great as to prevent the business of the house being carried on as usual. On examination, the principal injury is found to arise from an original defect in the foundation, which the owner is going to remove, by rebuilding that part of the house.- Mrs Carrick, the tenant, suffered considerably by the loss of furniture, wearing-apparel, &c. notwithstanding many of those articles had been previously taken to a place of supposed safety.- The plan, which will be pursued with the greatest dispatch, is thought likely to secure these premises from similar overflowings of the tide, if so extraordinary an event should ever again happen. CP 23 Feb 1796: In consequence of the grievous loss sustained in furniture, wearing apparel, &c. by the tenant at the Skinburness Hotel, a very great number of the principal inhabitants of that neighbourhood, joined by several from Wigton, Holm-Cultram, &c. assembled there on the 15th inst.- The hounds belonging to William Glaister, Esq. of Red-Flat, were cast off, and the day, proving remarkably fine, afforded much amusement to those who are fond of the chase. About two o'clock, the company, (which was augmented by the master and forty young gentlemen from the academy at Green-Row) sat down to a plentiful dinner, at the HOTEL; where the day was spent in the greatest harmony, and the entertainment highly improved by the humane motives that occasioned it:- "miseris succurrere disco".